Kim Yong-min, an opposition candidate under fire for past remarks, reiterated Sunday that he would not drop out of the race. “I will run to the finish line and let voters judge me,” he said. The main opposition Democratic United Party candidate is contesting a parliamentary seat representing Seoul’s Nowon-A constituency. Polls conducted early last week showed him neck-and-neck with a candidate from the ruling Saenuri Party. “I can’t let the Saenuri Party and ‘Cho Joong Dong’ go on like this anymore,” the candidate said, referring to the ruling party and three conservative newspapers which have criticized him. His reaffirmation came after the chief of his party offered an apology to voters, amid fears that public anger over Kim could spill over to other races. Kim had already apologized for the remarks. “Candidate Kim’s past remarks were wrong. I apologize to those who may have been hurt by his words,” Han Myeong-sook said through her aide. The party had demanded Kim give up the race, but Kim declined, insisting that the voters should judge him, the opposition leader said. 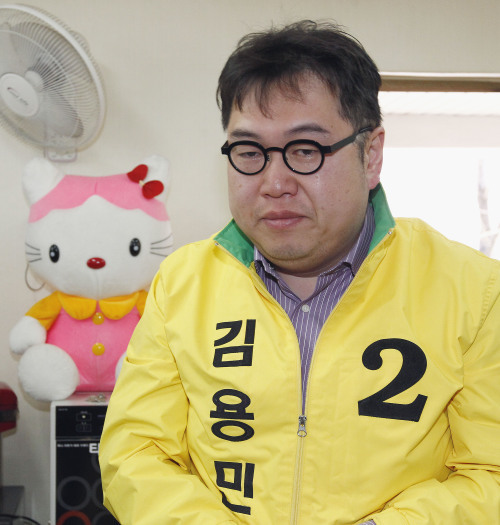 Kim, a political commentator by profession, earned fame for his raunchy humor on a political satire show. He came under attack from opponents over foul and sexual comments he made on a different internet show eight years ago about U.S. government officials, including Condoleezza Rice.